Pat Divilly is one of Ireland’s most in-demand personal development & wellness speakers as well as being a best-selling author and provider of online courses and content. This interview with Smarter Egg founder Aodan Enright reveals a lot about Pat’s motivation for doing the work that he does. He talks about his journey from aspirations of being a cage fighter to ups and downs in the fitness world, before finding a breakthrough in the online space. Pat’s story is fascinating, but equally enthralling are the many lessons he has learned about himself along the way, many of which are useful for us all. At the same event, Martin Brennan spoke on the topic of fear, which is referred to several times in Pat’s interview. 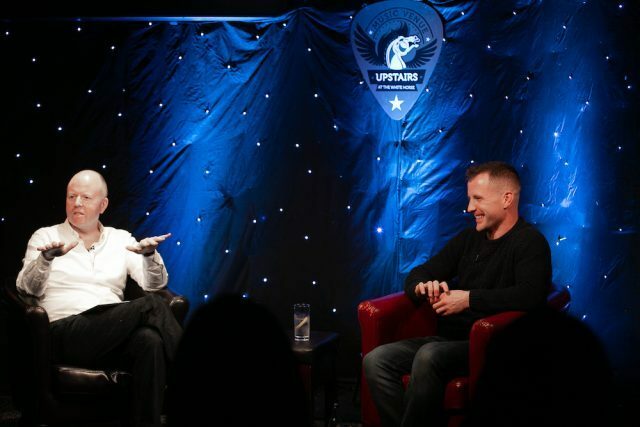 This conversation was recorded at a Smarter Egg event at Upstairs at the White Horse, Ballincollig, Ireland in April 2018. The video footage was filmed and edited by AV3 Productions. This entry was posted in Red Chair, White Horse on October 16, 2018 by Aodan Enright.